Bob and Suzanne Wright, 2010 Recipients of The American Ireland Fund’s Humanitarian Award. of Event: Annual black-tie dinner dance begins with cocktail reception and includes a live auction. 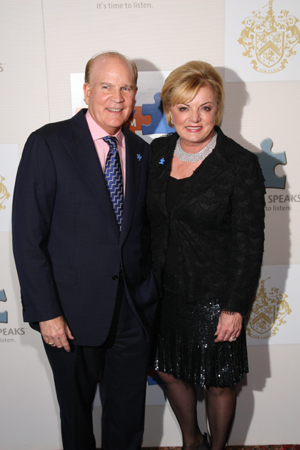 Bob and Suzanne Wright, founders of Autism Speaks, will be honored at the gala with AIF’s Humanitarian Award for their dedication to promoting worldwide awareness of autism. Honorary Chairman is Mrs. David "Hillie" Mahoney. The American Ireland Fund’s mission is to be part of the largest worldwide network of people of Irish ancestry and friends of Ireland dedicated to raising funds to support programs of peace and reconciliation, arts and culture, education and community development throughout the island of Ireland. Every year, The American Ireland Fund donates a portion of the proceeds raised at the dinner to a local charity selected by the Dinner Chairman.